ESCONDIDO, Calif., May 13, 2016 /PRNewswire/ — GoGather, a leading global events management agency, announced today that Anne-Sophie Michas has joined the agency as Managing Director in Europe, the Middle East and Asia (EMEA) to expand its international events capabilities. Anne-Sophie, who is based in Rome, brings to her new assignment more than 10 years of hospitality and event management experience in Europe and the U.S.
We are excited to have Anne-Sophie join our team because she’ll help us take GoGather’s client support to the next level as our ‘cultural translator’ in EMEA, said Brian Kellerman, CEO and co-founder of GoGather. Anne-Sophie has a wealth of knowledge and on-site experience supporting unique, memorable corporate events and incentive programs for discerning clients on both sides of the Atlantic. Anne-Sophie’s European location and her background will strengthen GoGather’s personalized style of service by giving clients an on-site expert to help plan and manage their events. She’ll support the agency’s North American clients in EMEA and EMEA clients in North America. She’ll also help GoGather develop new relationships and increase the agency’s presence in the marketplace. Her established relationships with leading hotel and destination management companies will enable her to negotiate attractive pricing at preferred event venues. Before joining GoGather, Anne-Sophie served as Director of Sales and Marketing for Mutika Group managing events across Italy. She has also supported Starwood Hotels & Resorts’ Venice properties from the chain’s regional office in Rome, and managed food and hospitality event services in Manhattan for Union Square Hospitality Group. Anne-Sophie earned her master’s degree in food and beverage management from the internationally acclaimed SDA Bocconi School of Management in Italy. She’s also fluent in English, French, Italian and Spanish. 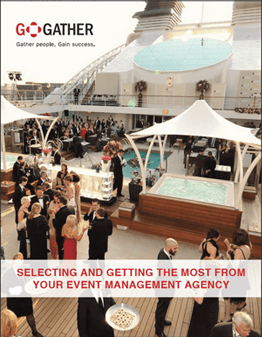 GoGather ( www.gogather.net ) is a leading events management agency that was established in 2008 to strategically design and manage corporate events, trade shows and exhibitions, and incentive programs that increase the business impact for clients. The agency meets the needs of global Fortune 500 companies as well as entrepreneurial start-ups in North America and EMEA. GoGather has consistently expanded its client base by providing personalized services, exceptional destination recommendations, innovative event concepts, advanced technology solutions and strategic meetings management processes that deliver superior value and results.